The Shoals Research Apprenticeship is a two-part, four-week program aimed at providing you with the opportunity to learn the ins & outs of independent biological field research. This program prepares you to be a competitive applicant for NSF REU programs and other research opportunities next summer. 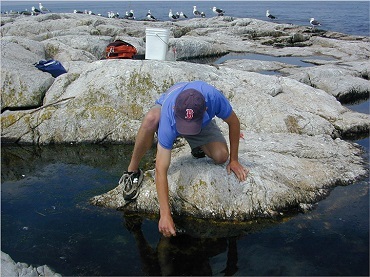 The Shoals Research Apprenticeship combines Investigative Marine Biology Laboratory (BIOSM 1500 / MEFB 403, July 15 – July 29, 2019) with Research in Biology (BIOSM 4990 / MEFB 751, July 29 – August 12, 2019). In the first course, you will gain in-depth understanding of research methods and develop your own research proposal. In the second half of the program, you will carry out your independent research project with the help of SML faculty mentors and your group of fellow apprentices. Build your resume/CV this summer! Make this the summer you become a scientist! Join faculty member, Dr. Doug Fudge, in this immersive course that decodes the scientific process. Investigative Marine Biology Laboratory provides a field and lab intensive marine-based introduction to the scientific method and experimental biology. The course is structured around two research projects that explore how marine organisms are adapted to the physical and biotic factors in their environment. Cornell students, this course is equivalent to BioG 1500 at Cornell University, which fulfills course requirements for Biological Sciences, Biology & Society, Biological Engineering, Physical & Life Sciences, and Physical & Biological Sciences majors.